Mapped from MA DEP data for Eelgrass and Seagrass communities as well as tidal flat, open water tidal, brackish, and salt pond from Mass GIS. Estuaries and embayments are areas where fresh and salt water mix. Estuaries are tidal areas near the mouths of rivers, while embayments are recesses in coastlines that form areas larger than a cove but smaller than a gulf. Generally, they are shallow, nearshore areas of the ocean that are somewhat protected from the full energy of ocean waves by barrier beaches, islands, coves, or some degree of land cover. They are typically found at the mouths of freshwater rivers and streams where they meet the ocean. This intersection of marine and freshwater is often a highly productive environment, meaning it supports high growth of primary (phytoplankton) and secondary (zooplankton) producers. As such, estuaries and embayments also provide essential habitat for a variety of forage fish, coastal fish, migratory birds, crabs, and mollusks. They also foster organisms that are harvested for economic gain and human consumption, such as crabs, bivalves, and coastal fish. Estuaries and embayments also support many recreational activities including kayaking, boat harbors, and fishing. 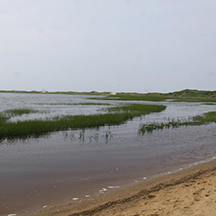 Estuaries and embayments encompass a variety of nearshore habitats (open water, salt marshes). Climate change impacts such as development, nutrient loading, invasive species, and pollution will impact estuaries and embayments. The extent to which these stressors impact these habitats depends on the bay size, water depth, location, surrounding landscape topography, vegetation composition, and invasive species. Sea level rise is expected to change the shape, depth, community composition, and extent of estuaries and embayments by increasing the amount and distribution of open water 2, while reducing the extent of salt marsh habitats 4. Many of the organisms that inhabit estuaries and embayments are highly vulnerable to climate change, such as alewives, blueback herring, American shad and blue crabs. 2. MA CCVA: Manomet Center for Conservation Science (Manomet) and Massachusetts Division of Fisheries and Wildlife (MA DFW). 2010. Climate change and Massachusetts fish and wildlife: Volume 2 habitat and species Vulnerability. 3. Sneddon, L. A., and G. Hammerson. 2014. Climate Change Vulnerability Assessments of Selected Species in the North Atlantic LCC Region. NatureServe, Arlington, VA.
4. Whitman, A., A. Cutko, P. De Maynadier, S. Walker, B. Vickery, S. Stockwell, and R. Houston. 2013. Climate change and biodiversity in Maine: vulnerability of habitats and priority species. Report SEI-2013-03. Manomet Center for Conservation Sciences (in collaboration with Maine Beginning with Habitat Climate Change Working Group), Brunswick, ME. Adaptation Subcommittee to the Governor’s Steering Committee on Climate Change (ASGSCCC). 2010. The impacts of climate change on Connecticut agriculture, infrastructure, natural resources and public health. Increasing freshwater runoff events will result in sudden inputs of warm water particularly during summer, increased sedimentation and turbidity, erosion, higher nutrient inputs, and periods of lower salinity. Higher temperatures may benefit pathogens or invasive species? Whitman, A., A. Cutko, P. De Maynadier, S. Walker, B. Vickery, S. Stockwell, and R. Houston. 2013. Climate change and biodiversity in Maine: vulnerability of habitats and priority species. Report SEI-2013-03. Manomet Center for Conservation Sciences (in collaboration with Maine Beginning with Habitat Climate Change Working Group), Brunswick, ME.